Zelus longipes (Milkweed Assassin Bug) ♂. Size: approx. 10-15 mm. Photo: 06/19/11, 1 pm. 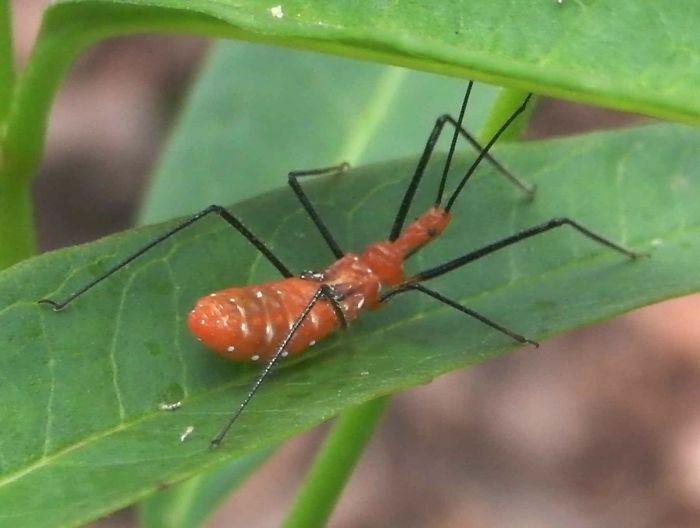 This is a 'milkweed assassin bug' a.k.a. 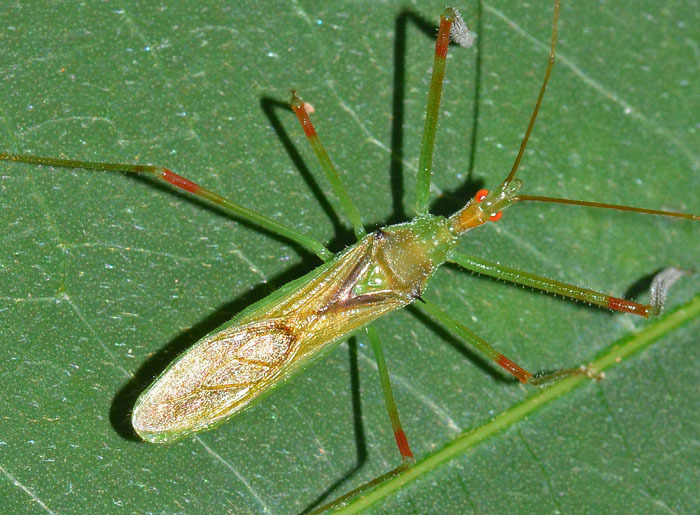 'longlegged assassin bug' (Zelus longipes). It is a beneficial insect as it feeds on prey such as flies and mosquitoes. It is no threat to us but the 'bite' can cause a burning sensation lasting several days. Their size and color varies greatly. Zelus longipes (Milkweed Assassin Bug) ♀. Size: approx. 10-15 mm. Photo: 12/31/69. I believe this bug is a female of Zelus longipes. It's a mimicry of the large milkweed bug (Oncopeltus fasciatus). 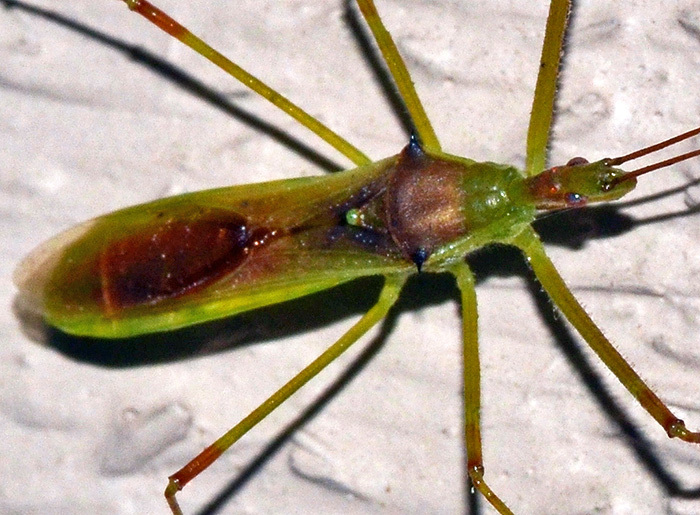 Zelus luridus (Pale Green Assassin Bug) - imm. Size: approx. 10 mm. Photo: 06/15/14, 7 pm. 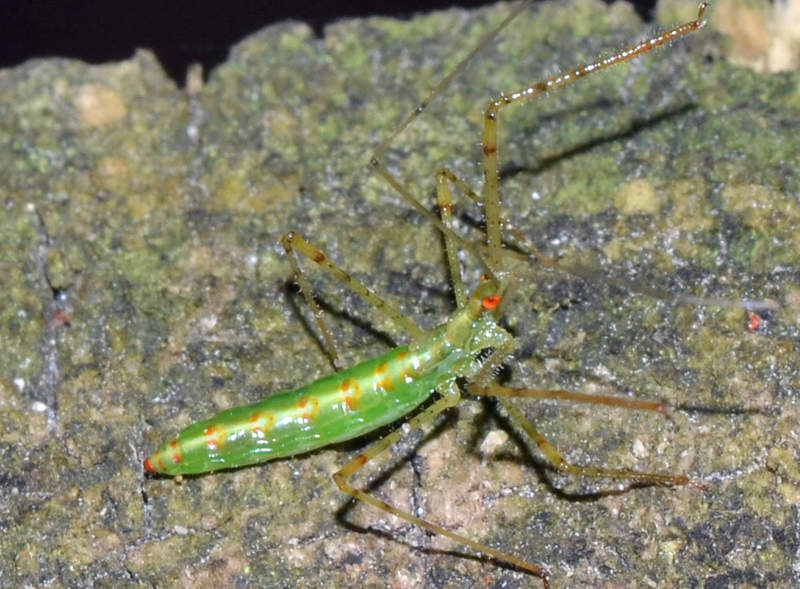 A nymph of the Pale Green Assassin Bug. The small photo shows the same specimen whereas the grown-up version is shown in the row below. Zelus luridus (Pale Green Assassin Bug). Size: approx. 20 mm. Photo: 06/26/14, 7 pm. 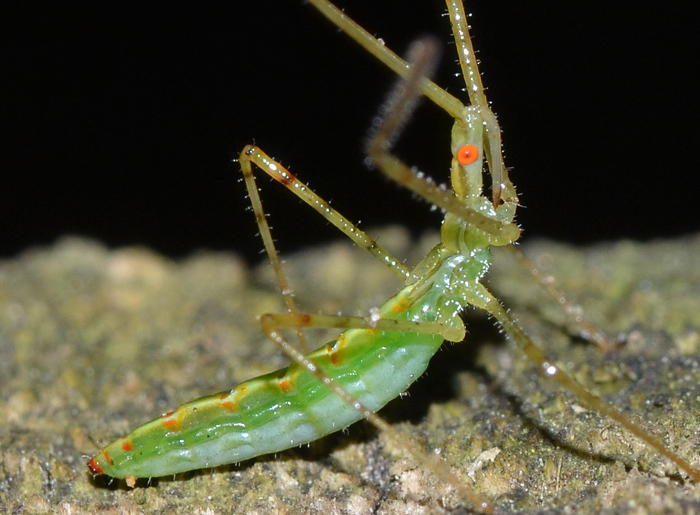 Again, the Pale Green Assassin Bug but this time the mature version. 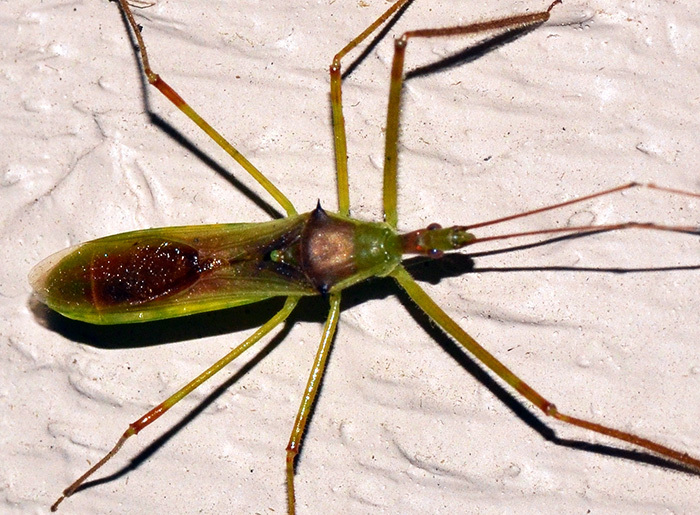 This is the most common species of Zelus in the eastern US and uses sticky traps as a predation strategy, which is also common to other species in the genus Zelus. The sticky material is produced by a gland on the leg. This gland develops in the second instar. The small photos (09/29/18) show a different specimen. 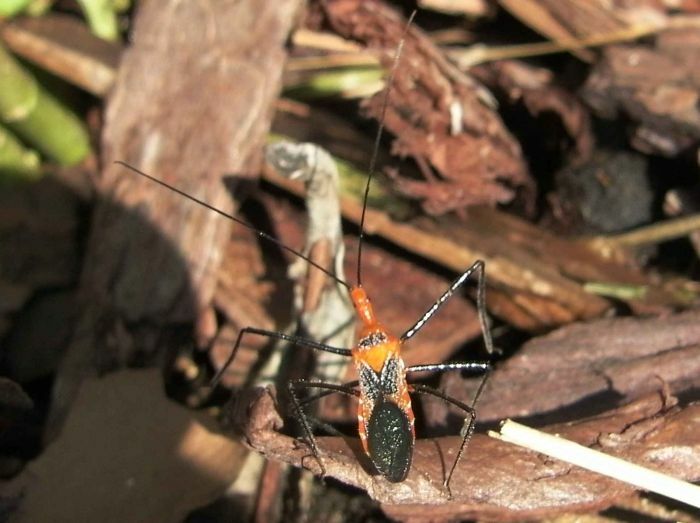 Zelus tetracanthus (Four-spurred Assassin Bug). 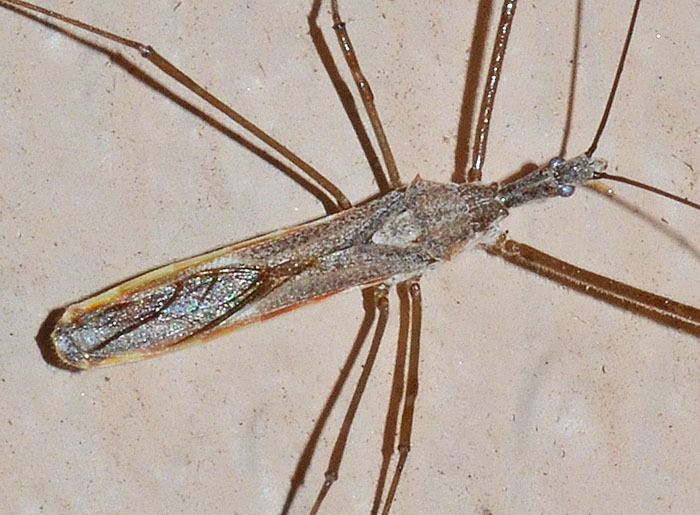 This long-legged assassin bug is probably Z. tetracanthus. It has the usual two spines on the shoulders (humeral) and in addition two spines on the top of the thorax. It is broadly distributed across the US. Citing from the second link: "Z. renardii is common in suburban and disturbed habitats in addition to certain natural areas, whereas Z. tetracanthus is usually restricted to natural areas. The behavioral comparison under laboratory conditions indicated that Z. renardii caught prey faster and that feeding duration in this species was shorter than in Z. tetracanthus."